I’m on the left – GO NASA! Brown SpaceMan is a blog that will guide you through the cosmos with stunning images and easy to read content. My goal is to try and excite more people about astronomy, cosmology, or anything related. Carl Sagan once said, “We live in a society absolutely dependent on science and technology and yet have cleverly arranged things so that almost no one understands science and technology. That’s a clear prescription for disaster.” That statement made a lot of sense to me and it made me also realize how important science communication is. After starting this blog in 2012 I volunteered for a website called Penny4NASA in January 2013. This is where I finally got to share my love of astronomy and fight for an amazing cause: To double NASA’s budget so that we could see even further than our current frontier. 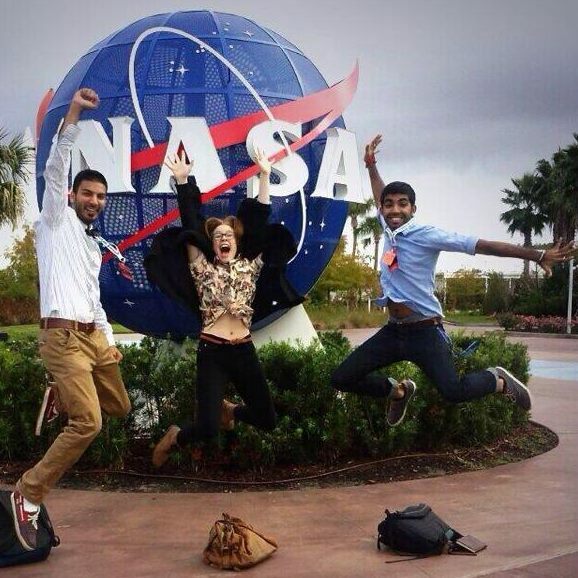 I also attended a NASA Social event in 2013 for the The Mars Atmosphere and Volatile EvolutioN (MAVEN) mission, where I felt completely inspired to keep writing on my blog and keep moving forward on my space journey. I’ve contributed to Astronaut.com as well as helped out raising funds for Alyssa Carson, future Mars-walker. In my spare time I record and play music and I also post on my tumblr so check it out if you’re interested. Well hope you enjoy the site and please don’t hesitate to email me at BrownSpaceMan@gmail.com.